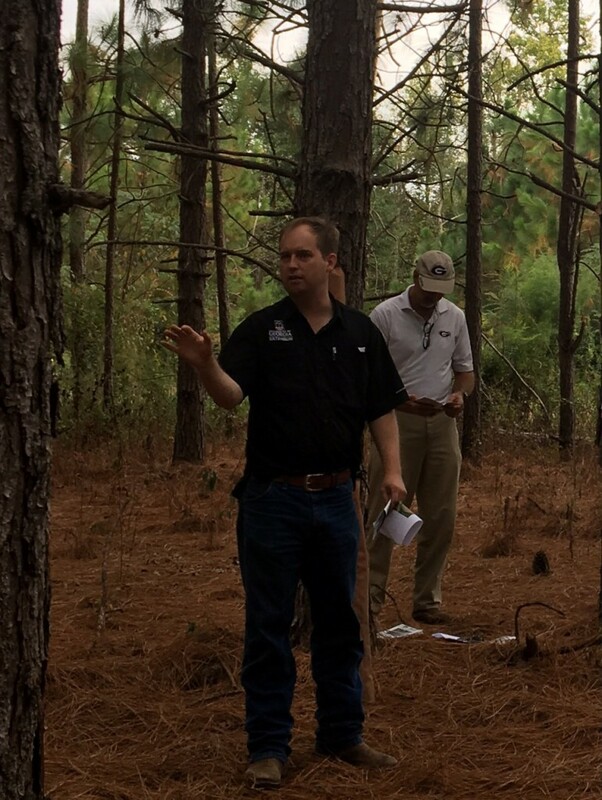 UGA Extension Forester Dr. David Dickens is out of Statesboro and covers pine tree production (thinning, basal area, fertilization etc.). He was showing us how to measure crowns for thinning. In this case, we are pushing the thinning of the longleaf out so we can get straw. This is something we can do with longleaf that cannot be done as well with slash or loblolly. One of the most common questions county agents receive concerning forestry is pine bark beetles. I gave a presentation on the different primary and secondary beetles and how they kill trees. Most of our beetle attacks are from Ips Engraver Beetles, which are unpredictable. They usually kill 10-15 trees and leave. For this reason, we don’t cut the trees down and do further damage. 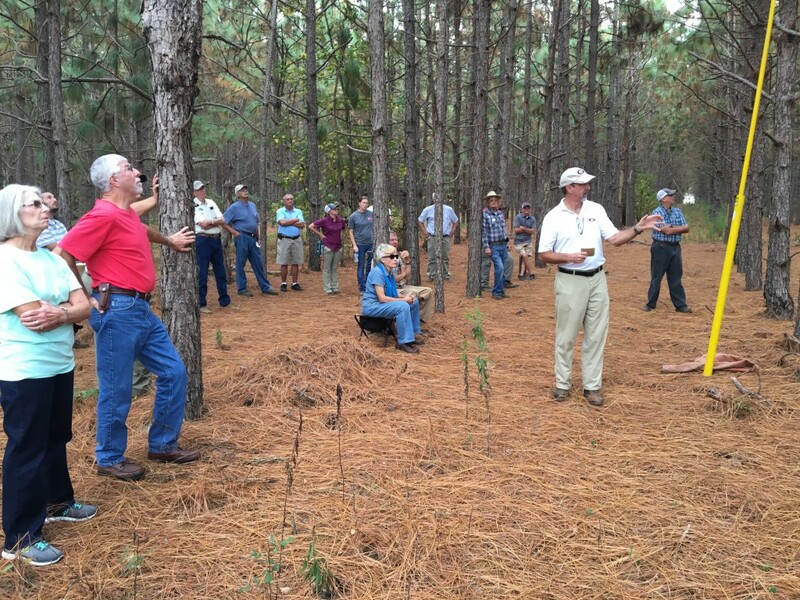 We were also joined by our Georgia Forestry Commission Foresters in the area. Mr. Chuck Fore (middle) adds some good information about bark beetle and Southern Pine Beetle in the area. UGA Extension Forester Dr. David Moorhead (left) is going to retire early next year and has been wonderful resource to us over the past 30 years. 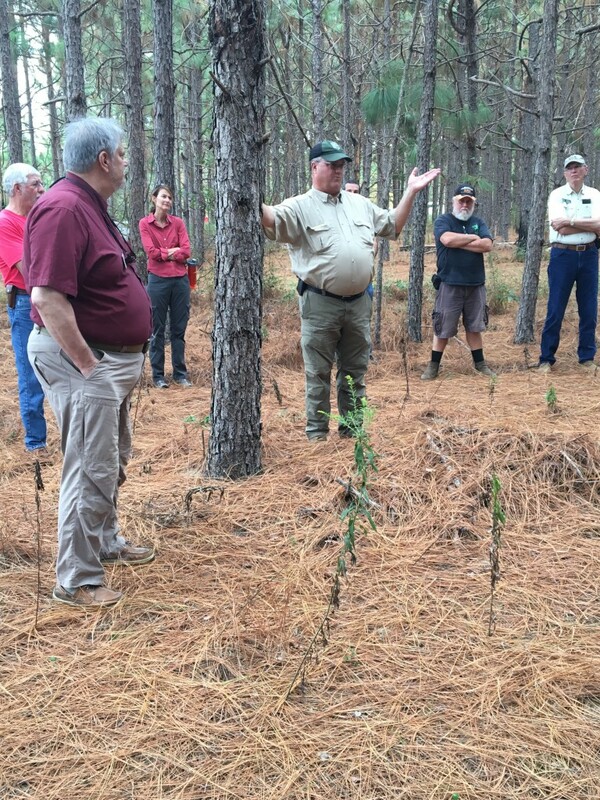 Tuesday he covered controlling invasive species and evaluating stands for pine straw raking. 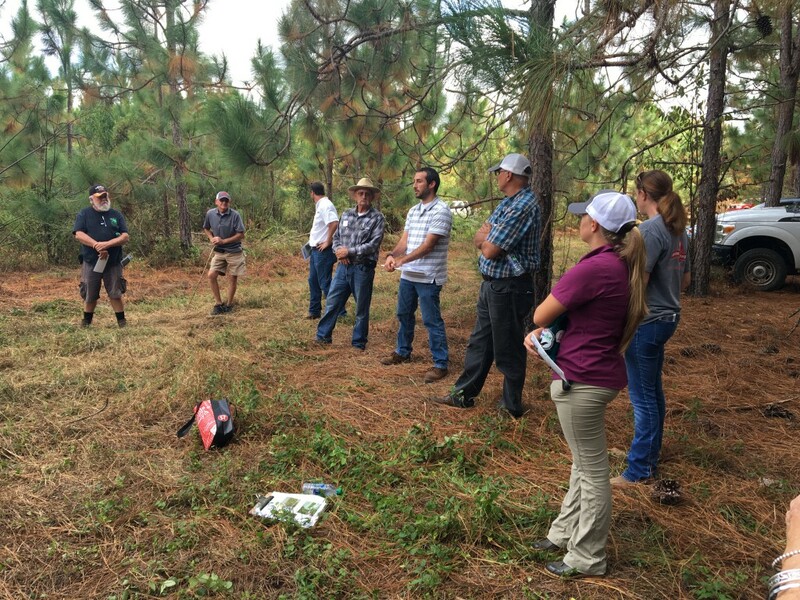 We looked at two different plantings: 20-year old Longleaf and 10-year-old longleaf. In this picture, our regional NRCS conservationist Dustin Stonner gives us an update from their office. Dustin, Garrett and Xavier Murphy have done a good job for us in the county. 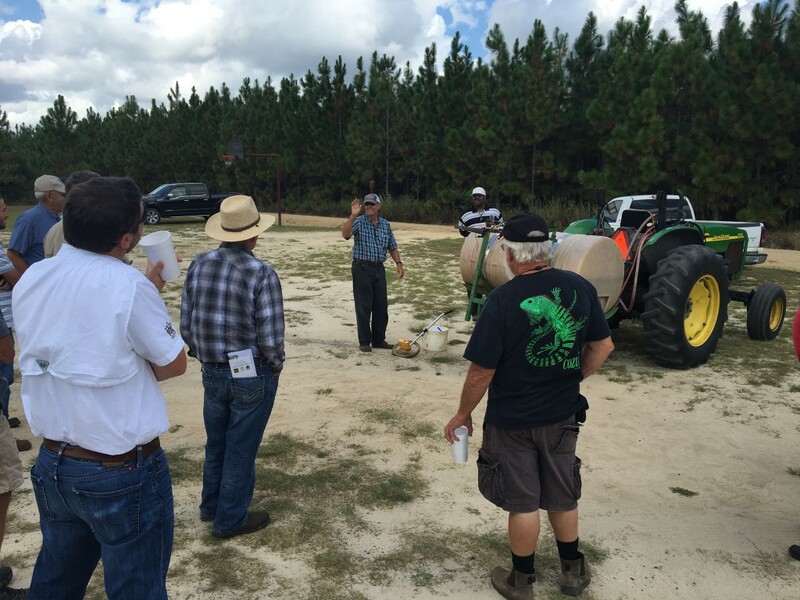 Following lunch, Mr. Ronnie Barentine showed us how to calibrate a boomless sprayer. When we use non-selective, non-soil active herbicides such as triclopyr, we use % solutions. But when we use soil active herbicides, we have to get these rates per acre accurate or else we damage trees. It’s easy to overlook, but calibration is extremely important. This is Ronnie showing us the 2 nozzles and how to calculate gallons per acre. Thank you so much to Pastor Danny Allen and members of Pope City Baptist Church for cooking us a great pork chop dinner. Thank you Mr. Pete Peebles for hosting this year’s program. We were able to see the difference in management of two different plantings and how to evaluate these stands. 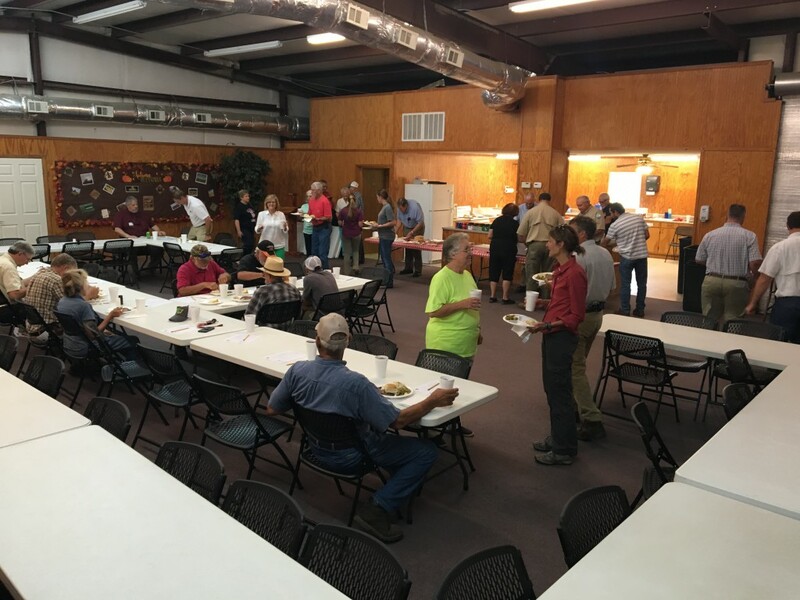 We were glad to be joined by retired Georgia Forestry Commission forester Mr. Grady Williams also attended. 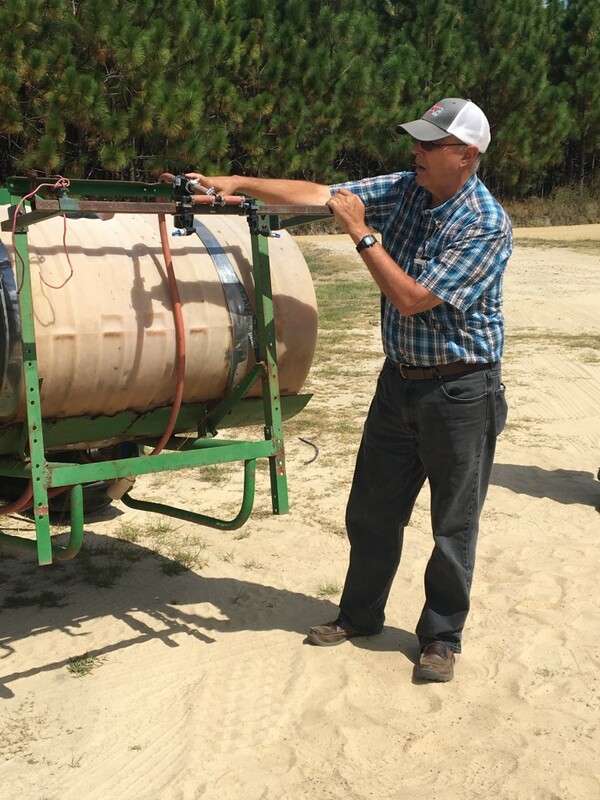 He has truly been a pioneer for longleaf in this area, planting management, you name it.